Helloo.. I just tried a new way to wear hijab. 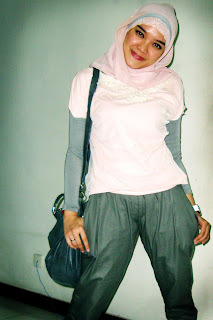 Actually this is a modification style from the Dian Style hijab and myself. I add new element in the model which is I wear two different kind and colors of inner scarf. I wear a lace and spandex inner scarf with different color. Well its fun anyway, so we can mix and match our inner scarf with the outfit. Happy try! arrgghhh gray.. agaiinn?? sorryy.. promise you, next outfit.. i'll try not to wear anything gray.. :) InsyaAllah..
make it fast yaaaa!!! hohohoho..